Undocumented and Coming of Age: What lessons can Europe draw from the USA? And Lilana Keith (PICUM Advocacy Officer). What are the daily realities of undocumented migrant youth coming of age? What challenges do their face in their everyday lives? And to what extent does a lack of residence status impact their well-being and participation? To find the answers to these questions, Roberto G. Gonzales, Assistant Professor of Education at Harvard Graduate School of Education carried out a study following 150 undocumented young adults in Los Angeles for a period of 12 years. His findings were published in the book ‘Lives in Limbo: Undocumented and Coming of Age in America’. Photo: Participants of the debate at the European Parliament. 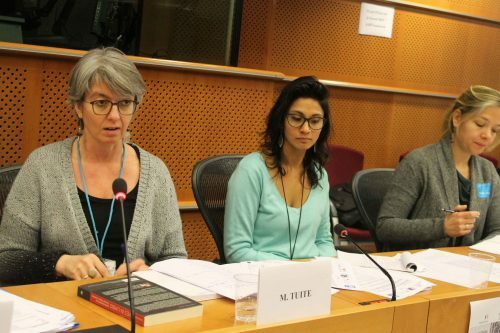 PICUM and the European Youth Forum seized the opportunity to organise a book launch to explore parallels between the situation in the United States and in Europe and to see what lessons EU policymakers and service providers could learn from the US. 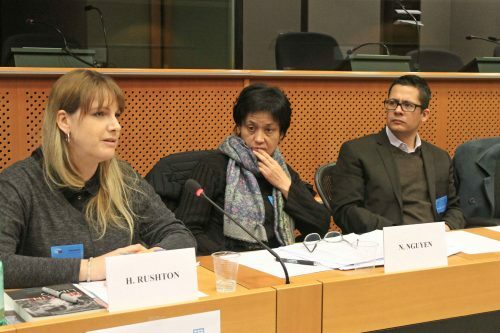 The book launch, held at the European Parliament on 16 March 2016 and co-hosted by Brando Benifei (S&D MEP and Vice-Chair of the Youth Intergroup), Caterina Chinnici (S&D MEP and Co-Chair of the Intergroup on Children’s Rights) and the European Parliament’s Intergroups on Youth and on Children’s Rights, gathered EU policymakers, European civil society, national and local youth organisations and service providers who work directly with undocumented and formerly undocumented youth. Across the US and Europe undocumented young people face social exclusion, very restricted access to the labour market, limited or no access to higher education and social welfare services, with significant negative impacts on their mental health and overall well-being. The shock of the transition to adulthood depends to some extent on the protections afforded to them while they are children, which are suddenly removed when they come of age. 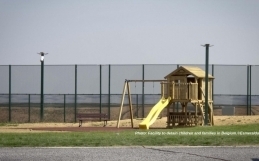 Access to basic services and inclusion of undocumented children vary more across Europe than the United States, but a number of similarities were identified, particularly with participants from the UK, France and Belgium, where undocumented children can usually go to school. In practical terms, this means that a young person might have completed all their compulsory education, but cannot start professional training or go to university. Simply put – they cannot pursue their dreams and move forward with their lives as their peers do. They are blocked from the normal rites of passage from adolescence to adulthood and autonomy: getting a job, getting a drivers’ license, going to bars and the cinema. Instead they have to accept a new reality, of being an undocumented adult. According to Roberto Gonzales, residence status becomes a ‘master status’, meaning that the lack of regular residence status eventually dominates all of the social life and career plans of undocumented young people. Together with the constant fear of apprehension and deportation, Roberto Gonzales’ research found that undocumented youth consistently experienced poor mental and physical health, such as chronic headaches, chronic toothaches, sleeping disorders, and suicidal thoughts, because of the stresses around living with irregular status. Photo: Civil society representatives from France, the UK and Belgium shared the realities of undocumented youth in Europe. In this context, the role of organisations in supporting and empowering these young people is crucial. Examples for this are self-advocacy groups, such as the Kids Parlement in Belgium and Brighter Futures in the UK, community mobilisation initiatives, such as the French Réseau Education Sans Frontières (RESF), and organisations providing social and legal services, such as The Prince’s Trust and Praxis in the UK and Progress Lawyers in Belgium. However, civil society organisations cannot address these challenges alone. 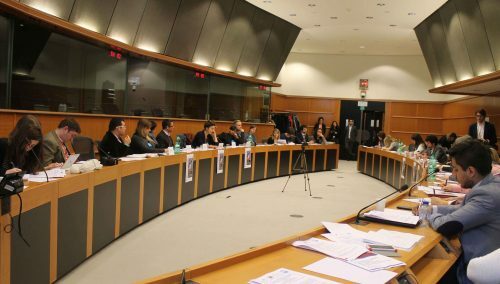 Participants of the debate underlined the urgent need for policymakers to take action at national and EU levels. The rights of undocumented children and youth are not sufficiently addressed in EU and national policies. A few EU policies and institutional developments have made important steps towards recognition of the need for a more comprehensive and rights-based approach to all migrant children, but much more effort is required to ensure the rights of migrant children and young people. Representatives of the EU institutions pointed to key EU policy work and instruments which could and should better include migrant youth, including the Youth Guarantee, the Erasmus+ programme, the Integration Action Plan, and work on labour market integration. They also noted major policy gaps around the transition to adulthood, regularisation, and mental health. 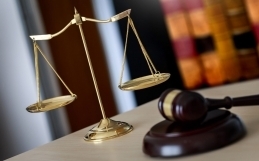 Ensure equal access to services, protection and justice, without legal or practical obstacles. This should include a ‘firewall’ – a strict separation of schools, health care and other service providers, labour inspections and access to justice, from immigration enforcement. 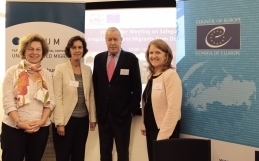 Review and adapt all aspects of migration and asylum policies and procedures to consider and fulfil age-specific rights, risks and needs. This should include addressing the specific situation of children as they transition to adulthood. Make accessible permanent mechanisms to access long-term regular migration status on the basis of reasonable conditions (such as years of residence, participation in education, and social connections). Empower migrant youth to defend their rights, in particular through access to competent and effective legal representation, and build capacity of youth-led organisations working on migration issues, including awareness-raising and community organising. To watch a video interview with Roberto Gonzales explaining his key findings and his impressions about the situation in Europe, click here.